– The end of the 7th working day when all such information as required by law has been supplied by us. The Consumer’s right to cancel an Order does not apply (i) if the Products are opened or used. (ii) if the packaging is damaged. The item must be returned in ‘perfect resellable condition’ (including that there are no visible damage or marks on the item). The Product is returnable at the Consumer’s cost. You will not incur any charges or penalties for so doing except the direct cost of returning the Products. No refund will be made until the Products are returned to us and in any event no refund will be forthcoming if the Products are not received by us within 30 days of you notifying us of your intention to return them. Delivery of purchase ; If the delivery is by An Post and there is no one at the delivery address to receive the parcel, An Post will leave a docket noting where the package can collected. If the Parcel is not collected from the collection An post collections depot, Original Beauty.ie will not take responsibility for the delay in the delivery to the customer. 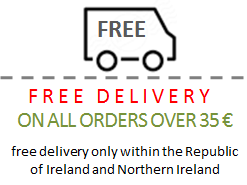 If the delivery is done by courier company and there is no one at the address to receive the parcel, the courier will contact the customer on the phone number given to Original Beauty.ie to arrange another delivery. In such cases, Original Beauty.ie will not take responsibility for the delay in delivery. Ownership of Site; Agreement to Conditions of Use These Terms and Conditions of Use (the “Conditions of Use”) apply to the Original Beauty Limited / www.originalbeauty.ie Website and store, located at www.originalbeauty.ie and www.originalbeauty.ie/store. These sites are the property of Original Beauty Limited. BY USING THESE SITES, YOU AGREE TO THESE CONDITIONS OF USE; IF YOU DO NOT AGREE, PLEASE DISCONTINUE USING THE WEBSITES. By accessing, browsing and/or using our website and store, you agree to the following terms and conditions and agree to use the site in accordance with all applicable laws. If you do not agree you must cease to use our website. IF YOU DO NOT AGREE, PLEASE DISCONTINUE USING THE WEBSITE & store IMMEDIATELY. These terms and conditions will be governed by and construed in accordance with the laws of Ireland and those applicable within the European Union. Original Beauty Limited / www.originalbeauty.ie reserves the right, at its sole discretion, to change, modify, add or remove portions of these Conditions of Use, at any time. Such changes will be updated on the website and it is your responsibility to check these Conditions of Use periodically for changes. Your continued use of the Site following the posting of changes will be deemed as acceptance of any changes that may have been made. Agreement with the Conditions of Use, provides you personal, non-exclusive, non-transferable, use of the Original Beauty Limited / www.originalbeauty.ie website and store as defined in the Conditions of Use. The copyright in the content contained in this website and the products available for download belongs to Original Beauty Limited / www.originalbeauty.ie or its licensed source. The content on this website may NOT be used for commercial purposes without the express prior written consent of Original Beauty Limited / www.originalbeauty.ie. The content on this website is protected by copyright and may not be reproduced or appropriated in any manner without the written permission of its respective owner(s), except to the extent permitted by relevant copyright legislation. No part of the Original Beauty Limited / www.originalbeauty.ie website(s) or content may be copied, reproduced, republished, uploaded, posted, publicly displayed, encoded, translated, transmitted or distributed in any way (including “mirroring”) to any other computer, server, website or other medium for publication or distribution or for any commercial purpose, without the express prior written consent of Original Beauty Limited / www.originalbeauty.ie. The images, logos and names on this website which identify Original Beauty Limited / www.originalbeauty.ie are proprietary marks of Original Beauty Limited / www.originalbeauty.ie. All rights are reserved. You may not probe, scan or test the vulnerability of the Site or any network connected to the Site, nor breach the security or authentication measures on the Site or any network connected to the Site. You may not reverse look-up, trace or seek to trace any information on any other user of or visitor to the Site, or any other customer of Original Beauty Limited / www.originalbeauty.ie, including any Original Beauty Limited / www.originalbeauty.ie account not owned by you, to its source, or exploit the site(s) or any service or information made available or offered by or through the site(s), in any way where the purpose is to reveal any information, including but not limited to personal identification or information, other than your own information, as provided for by the site(s). You agree that you will not take any action that imposes an unreasonable or disproportionately large load on the infrastructure of our website(s) or Original Beauty Limited / www.originalbeauty.ie’s systems or networks or those of our hosting company, or any systems or networks connected to the Site or to Original Beauty Limited / www.originalbeauty.ie. You agree not to use any device, software or routine to interfere or attempt to interfere with the proper working of our site(s) or any transaction being conducted on our site(s), or with any other person’s use of our site(s). You may not forge headers or otherwise manipulate identifiers in order to disguise the origin of any message or transmittal you send to Original Beauty Limited / www.originalbeauty.ie on or through our site(s) or any service offered on or through our site(s). You may not pretend that you are, or that you represent, someone else, or impersonate any other individual or entity. You may not use our site(s) or any content for any purpose that is unlawful or prohibited by these Conditions of Use, or to solicit the performance of any illegal activity or other activity which infringes the rights of Original Beauty Limited / www.originalbeauty.ie or others. Original Beauty Limited / www.originalbeauty.ie obligations, if any, with regard to its products and services are governed solely by the agreements pursuant to which they are provided, and nothing on this Site should be construed to alter such agreements. Original Beauty Limited / www.originalbeauty.ie may make changes to any products or services offered on the Site, or to the applicable prices for any such products or services, at any time, without notice. The materials on the Site with respect to products and services may be out of date, and Original Beauty Limited / www.originalbeauty.ie makes no commitment to update the materials on the Site with respect to such products and services. The details of products and services including the prices are subject to change without notice. The provision of details of products and services (if any) on this website is not, and should not be construed as, an offer to sell or buy such products or services by the relevant company nor any guarantee of availability. Certain features or services offered on or through the Original Beauty Limited / www.originalbeauty.ie store, such as purchasing products, may require you to open an account. You are entirely responsible for maintaining the confidentiality of your account information, including your password, and for any and all activity that occurs under your account. You agree to notify Original Beauty Limited / www.originalbeauty.ie immediately of any unauthorized use of your account or password, or any other breach of security. However, you may be held liable for losses incurred by Original Beauty Limited / www.originalbeauty.ie or any other user of or visitor to our site(s) due to someone else using your username, password or account. You may not use anyone else’s username, password or account at any time without the express permission and consent of the holder of that username, password or account. Original Beauty Limited / www.originalbeauty.ie cannot and will not be liable for any loss or damage arising from your failure to comply with these obligations. The contents, products and services available on our website(s) are provided on an “as is” and “as available” basis. Original Beauty Limited / www.originalbeauty.ie does not represent that the information contained in this website is accurate, comprehensive, verified, complete or error free. All information provided on the site(s) is subject to change without notice. While every precaution is taken to ensure the quality and safety of files and other data, Original Beauty Limited / www.originalbeauty.ie cannot guarantee that files or other data you download from the site(s) will be free from viruses, contamination or destructive features. Original Beauty Limited / www.originalbeauty.ie disclaims all warranties, express or implied, including any warranties of accuracy, non-infringement, merchantability and fitness for a particular purpose. Original Beauty Limited / www.originalbeauty.ie excludes all liability whether in contract or in tort (including negligence), to the maximum extent permitted by law, as to the compatibility, security, quality or fitness for purpose of any content or any goods or services available on this website. Original Beauty Limited / www.originalbeauty.ie will not be liable for any losses sustained and arising out of or in connection with use of this website(s) including, without limitation, indirect or consequential losses, loss of profit, loss of goodwill, loss of data or special loss. Original Beauty Limited / www.originalbeauty.ie accepts no liability for the contents of any other website you may access from our website(s). Such links are provided solely as a convenience to our visitors. Our “Conditions of Use” apply to www.originalbeauty.ie and www.originalbeauty.ie/store only and not to any third party websites. Original Beauty Limited / www.originalbeauty.ie reserves the right to at any time, without notice: (1) to modify, suspend or terminate operation of or access to the Site, or any portion of the Site, for any reason; (2) to modify or change the Site, or any portion of the Site, and any applicable policies or terms; and (3) to interrupt the operation of the Site, or any portion of the Site, as necessary to perform routine or non-routine maintenance, error correction, or other changes. (4) To delete/remove users accounts from the store, where said user is deemed (by the discretion of Original Beauty Limited / www.originalbeauty.ie) to be a in breach or our Conditions of Use, to be interrupting the normal operation of the store, presenting themselves as a nuisance to Original Beauty Limited / www.originalbeauty.ie and/or other users or if they present a security risk to the store, Original Beauty Limited / www.originalbeauty.ie and or any of our users/customers. In no event shall Original Beauty Limited / www.originalbeauty.ie, or any of its affiliates or licensors, be liable for any damages, including without limitation, special, indirect or consequential damages, or any damages, whatsoever resulting from access or use, or inability to access or use this web site or arising out of any materials, information, qualifications or recommendations on this web site. You agree to indemnify and hold Original Beauty Limited / www.originalbeauty.ie, employees, contractors, directors, shareholders, predecessors, successors in interest, subsidiaries and affiliates, harmless from any demands, loss, liability, claims or expenses (including legal fees), made against Original Beauty Limited / www.originalbeauty.ie by any third party due to or arising out of or in connection with your use of our websites. WARNING: INTERNATIONAL AGREEMENTS AND NATIONAL LAWS PROTECT COPYRIGHTED PICTURES, VIDEO RECORDINGS, AND SOUND RECORDINGS. UNAUTHORIZED REPRODUCTION, EXHIBITION, OR DISTRIBUTION OF COPYRIGHTED MATERIALS, IN WHOLE OR IN PART, CAN RESULT IN SEVERE CRIMINAL AND CIVIL PENALTIES UNDER THE LAWS OF YOUR COUNTRY. The information contained in both the Original Beauty Limited / www.originalbeauty.ie website and store are subject to change without notice. Copyright © 2011 Original Beauty Limited / www.originalbeauty.ie. All rights reserved. Original Beauty Limited / www.originalbeauty.ie, 2 Yellow Road, Dublin 9, Ireland.